The well-loved Maria's Packaged Goods has done some upgrading and renovating to turn the space into a place where we could spend all summer. Kimski brings us Korean-Polish fusion eats like the Maria's Standard sausage with soju mustard, a hybrid sauerkraut-slash-kimchi, scallions and an amazingly soft roll. It also made way for a second bar to be put in beside Maria's, a large indoor seating area, a back patio and a small front patio. While we're sure we'll still miss the pies from Pleasant House, we're certain that we'll be more than just fine with the Kimski menu. Edmar! What’s wrong with you! A burger between pizza puffs? I applaud your sense of the absurd but someone's going to take this seriously. The sticker that holds the wrapper together needs to have a graphic of a pipe on it that says underneath, "this is not a pipe" (hopefully in Polish). I'm blown away. 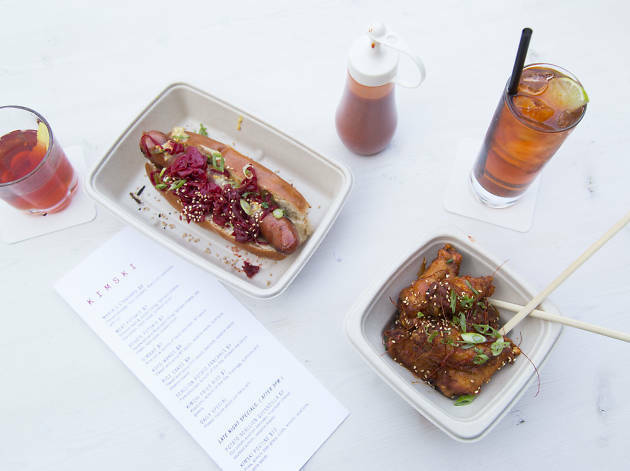 I was already obsessed with Maria's Packaged Goods, and I just had a great first experience dining at Kimski this past weekend. 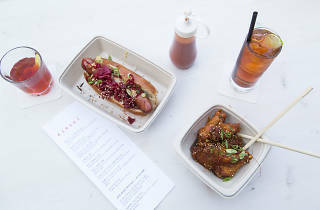 Kimski serves up creative and reasonably priced Korean-Polish comfort food ranging from potato scallion pancakes to sausages to chicken wings. Make sure to add an order of fries to your meal; they can't be missed! Maria's packaged goods /kimski is such a fun spot! Looking for a good spot to enjoy some sibling bonding, my brother and I came to this spot with our significant others. We were immediately greeted my Maria and were super impressed with the beer selection in the front-house coolers. As you might have guessed, there were Marz beers galore. Also on hand was one of the master brewers to answer any questions we might have. We passed through the liquor store front to make our way to the bar in back. For those of you that grew up in a house with wood paneling, you'll feel right at home. Don't let the dated decor fool you. The beer selection is fantastic and they even have some delicious cocktails. What makes things even BETTER is the ability to mosey on over to the Kimski side of the shop, which has an increased selection of drinks and food options and a way modern, open ambience. This place has about 3 personalities wrapped in one and will be a crowd pleaser. And don't forget to grab some beers to take home on your way out! WK works hard AF. Food is delicious and unique as its snowflake creator. This place has only been open a few months but they are killing it. With how busy it always is....I am shocked that I'm the first one to write about it. Maria's made the right move by bringing this place in. The partnership of one of the best bars south of the loop and some crazy good food makes the perfect combo for a night out. You have a few options for a dining experience here. You can sit in front of Kimski's and just grab some food, or you can enter through Maria's, and head to the new back dining area or the back patio. I recommend this option, so you are able to taste Maria's wide variety of craft beers or some of their amazing cocktails. As for the food, mixing Korean and Polish is a matchmade in heaven that I don't think most people expected. They're wings and Korean style polish sausage are insane but my favorite is the kimchi nachos topped with Korean bbq pork. I would recommended a few of the dishes and they're perfect to share with a few people.